Grey Gazelle, aka Cricket is a 15.2hh and growing, coming 4 year old black Holsteiner mare. She has 3 beautiful gaits and plenty of athleticism yet a super reasonable mind making her full of potential as an FEI horse. She has been under saddle since July working in the arena and on trail. She is currently Training Level working on the beginnings of First Level. Cricket has a sweet and snuggly personality easy to handle and not acting marish at all. She is tolerant of other riders regardless of their skill level though she is still a bit green and she is not very spooky. She has had a clean bill of health and current clean radiographs available upon request. Sir Conan Doyle, aka Smoothie, is a 2005 Oldenburg gelding by Sir Donnerhall out of a Lord Sinclair dam. He was imported from Germany in April 2010 and has been in professional training since then. 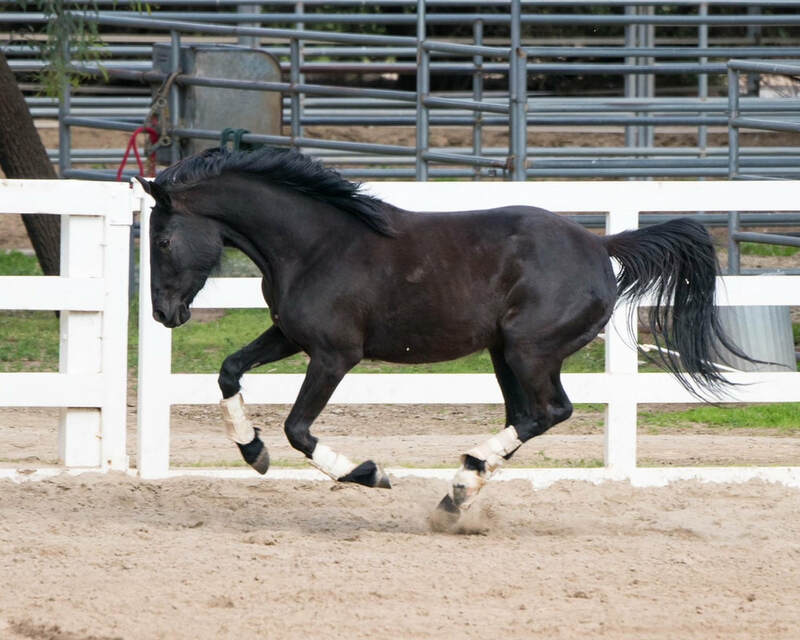 Smoothie has elastic, eye-catching gaits and has inherited his sire’s rideability. He is an uncomplicated horse suitable for the amateur and professional alike. 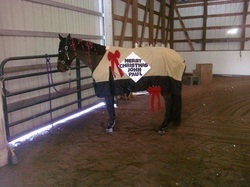 He would especially excel in the young rider arena. He has not had an intense show career but was very successful third level easily scoring in the high 60s. He was then sold 8 months ago to his current owner with a clean vetting and competed at del Mar at the end of the season winning his 4th level test. In addition to competing in dressage, he has also shown in the 3’ Hunters and the Level 1 Jumpers. He is currently competing I-1, scoring a 66% his first time out. Standing 17.2 hands, Smoothie is a gentle giant. He is easy to handle on the ground, loads easily, stands for the farrier and loves to be clipped. Fancy is a 10 year old Hackney Arab cross. 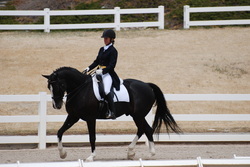 She shows plenty of talent and willingness to learn dressage with brilliant gaits. Standing at 15hh she is the perfect size for the aspiring amateur to handle. Vixen is a joy to be around. She is a dutch/thoughobred cross out of Flemmingh. 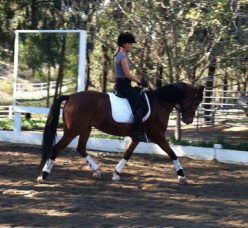 This 10 year old mare has fantastic gaits and will continue to develop into a fantastic dressage horse. She is currently training 3rd level. 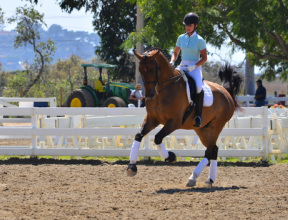 Level headed 16.2hh Oldenburg gelding competing I-1, schooling I-2, with scores of 68% and 69%! He is uncomplicated to ride, confident on trail and at shows as well as easy to handle on the ground. He is 9 years old with all the time and talent for Gran Prix. "Nell" is a very sweet 8yo 15hh Thuroughbred mare. She is sensitive but tolerant making a wonderful lesson or amateur horse. She has schooled through second level dressage and jumped up to 2'6".